Over the past few weeks China and Australia have both released white papers on energy. The two documents could not be more different. Australia’s white paper is largely about our continued obsession with becoming an alternative “Saudi Arabia” of gas. It has a view we should take over as the world’s largest exporter of gas before the year 2020. The White Paper has extensive sections on building up the gas and petroleum sectors, as well as coal for export, and allowing market forces to work in the national markets for liquid fuels. In all this, the White Paper has a single paragraph on the country’s disastrous increasing dependence on petroleum products imports. The chart 2.4 (p. 18) says it all. This chart reveals how poorly Australia has been served by the oil majors. While Woodside et al have been focused on the export market for bulk liquid and gaseous fuels, Australian motorists have been left in the lurch by the rundown in refining capacity. 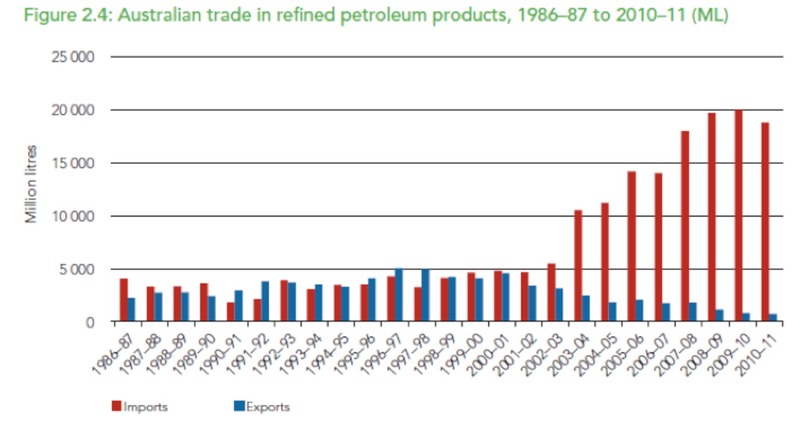 The result: the blowout in imports of “refined petroleum products”. But this is not the only glaring inconsistency in the White Paper. Its almost exclusive focus on export prospects for oil and gas (and to some extent coal) is achieved at the cost of any serious consideration of the building of the only long-term sources of energy security, which are renewables. In place of outlining the steps needed to transform our energy structure from one depending on digging up and burning fossil fuels to one that employs sophisticated technologies — so that solar, wind, geothermal and bioenergy could play an important and growing role — we find instead mere gestures towards the issues. There are no quantitative goals apart from the already announced Renewable Energy Target of 20% by 2020 (itself under constant attack). There is nothing new in the White Paper concerning building a solar industry, a wind industry, a “smart and strong grid” or even an industry for building the vehicle charging infrastructure needed for electric vehicles. There is no discussion of export prospects for Australian producers of renewable energy technologies and equipment — even though the Australian Trade Minister was instrumental in gaining acceptance for lower tariffs for such exports within APEC at the last leaders’ summit in Vladivostok. In other words — no ‘whole of government’ thinking. The contrast with China’s Energy White Paper could not be starker. China clearly views its energy security as the most fundamental feature of its future prosperity. It is building renewable energy industries as fast as is economically and technologically possible, as its major ‘nation building’ 21st century project. All government departments are focused on achieving the energy goals. 100 GW for wind (more than doubling the current capacity). 21 GW for solar PV (a seven-fold increase). massive expenditure on the electric power grid to make it the backbone of China’s 21st century industrial economy. The State Grid Corporation of China, for example, has announced a roll-out of its “strong and smart grid”. It is investing 4 trillion yuan up to 2020 (around US$600 billion), involving state-of-the-art high-voltage direct current (HVDC) transmission lines bringing power from the west, where it will be generated by huge wind and solar farms, to the east, as well as digital switching stations. Among other goals there will be diffusion of over 300 million smart meters, made and designed in China to Chinese standards. This is how to build an industry. China’s goals are being framed in terms of energy security and creating a 21st century economy where clean-tech industries will form the core of its energy independence and energy abundance. These industries will also create the export platforms of the future. The renewable energy industries and associated clean-tech sectors are identified in the current 12th Five Year Plan for active promotion. Their contribution to GDP rises from less than 4% in 2010 to an anticipated 8% by 2015 and 15% by 2020 – meaning that these core industries would be growing at more than 20% per year. Total investment in these core industries could be as much as 10 trillion yuan (or around US$1.6 trillion). And the strategies and targets outlined in the Energy White Paper (as well as the 12th Five Year Plan) will ensure that China’s carbon emissions plateau and start to fall, in line with international expectations. So here we have a tale of two visions of the future of a country. In Australia, according to the Energy White Paper, we still have a vision of ourselves as a country that digs stuff up and ships it out, or burns it. There is minimal regard to the processing value-added that can be done here (even to the extent of allowing the refining of petroleum for domestic use to be run down) and none to the export potential of renewable technologies. The building of new renewable energy industries as the core of a 21st century economy barely rates a mention, and no targets other than those already announced are mentioned. In China, by contrast, there is a vision of an economy that is rapidly making itself independent of fossil fuel imports (which are still rising, but can be anticipated to start falling within the decade). It is ensuring its long-term energy security by building the industries that will be able to supply power in abundance generated from super-abundant natural resources. There is a strong awareness that the infrastructure needed to accommodate these renewable inputs has to be supplied by government or a government-run corporation, and that massive investments are called for – which as they bear fruit, will translate into industrial and economic leadership. Australia used to have such a vision. It lay behind the creation of the Snowy Mountains scheme and the industrial spin-offs it created. Sadly that vision is long gone. The current Energy White Paper makes fossil fools of us all. John Mathews is a professor of strategic management at Macquarie Graduate School of Management.